Noelle Adam is a Dutch native, who practiced law for 10 years in the great city of Amsterdam before deciding she wants to be a designer. She graduated with fashion degree from some sort of UK based institution and launched her first pret-a-porte this year at the Dubai Fashion Week. 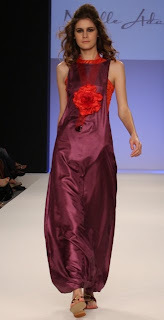 Noelle Adam won Dubai Fashion Week 2009 Emerging Talent Competion. I say her dresses are not bad for the former lawyer. Also, all her designs are also available in mini-me format for the little girls!